I live the strange life of innkeepers, working 7 or 8 months in a row with no breaks. However, we also get to have longer holidays in December and escape the cold to sunny and exotic corners of the world. Another advantage is that I don’t feel guilty for having stuffed myself with all sorts of holidays sweets. I did not, I suffered through tropical fruit shakes and green curries ;). Back to the grayness of January I feel I am allowed some comfort food. Don’t you? Every spring I make wild sour cherry preserves. The cherries are incredibly tart but intensely aromatic with an almond-y aftertaste. They complement perfectly the buttery lightness of the brioche. Blackberry or blueberry jam are good alternatives if you have no sour cherry. 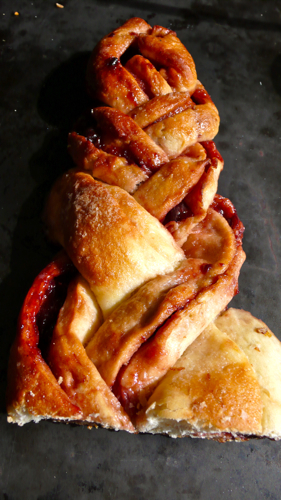 The brioche is an adaptation of my friend Corinna’s fabulous torta di rose. 100 g / 3.5 oz butter, softened at room temperature. Make the dough as explained for the torta di rose. Once leavened, transfer the dough onto a work-top, knead briefly and roll into a 3 mm (1/8 inch) thick square. 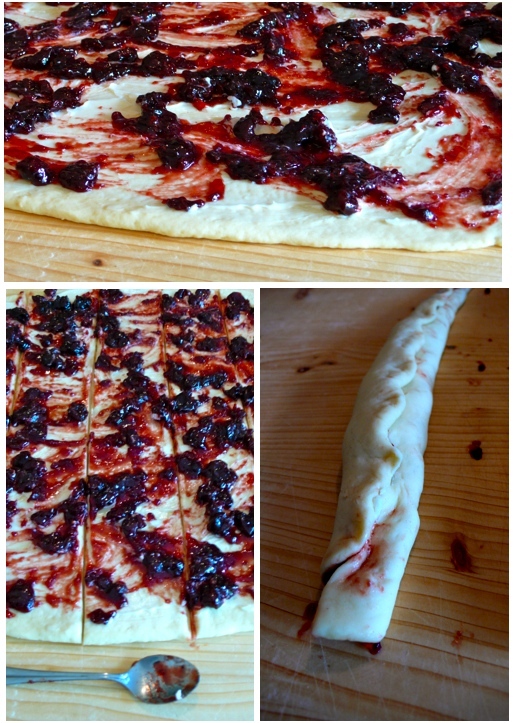 Using a flexible spatula, spread first the butter and then a thin layer of preserves over the dough. Cut the square into 6 strips which should be at least 10 cm. (4 inches) wide. Starting at the long side of each strip, roll the dough into a log, pinching gently to keep it rolled up. Line a baking sheet with parchment paper. Place 3 logs of dough seam side up and parallel to each other on the sheet. Beginning in the center and moving toward one of the ends, braid the logs. Turn the baking sheet around and repeat the same procedure for the opposite end of the logs. Pinch ends together and tuck the join under the braid. Make sure to use a small amount of preserves or all this will be a sticky mess! Make a second braid with the rest of the logs on a separate baking sheet or use a large baking sheet so you have at least 5 inches between the braids. Cover the baking sheet with a kitchen towel. Let the dough rise in warm draft-free area until almost doubled in volume, 45 to 60 minutes. You’ve made this look so so delicious–I’m salivating like mad. hi, i am just looking over some of your recipes and though i make the same things i was happy to see there is another way of making them. for instance, the fig cookies [cuciddata] what a wonderful idea of making them with cookie cutters i must say bravo ! keep the recipes coming…. Hi Letizia, love the comment about having our sundays all together! H Pam, lovey to see you here. I am taking full advantages of the Sundays, except no lingering in bed, Tea leaves for school at 7:20 a.m. still it’s wonderful to have some quiet time. Beautiful! Cherries and bread… It’s lovely. Bello! I have always been scared to tackle a full fledged brioche, but this delicious pic here makes me want to take on that challenge. Long time, Letizia! Hope you have been doing good. The secret of a brioche is in the waiting. You out it together and wait until it raises the first time. Then you fill it and wait until it raises the second time. Once you respect the timing the results are beautiful without much effort.